Matt Talbot (1856 – 1925) was born in the poverty of Dublin's inner city. He began drinking at twelve years of age and became a chronic alcoholic. Matt was an addict. After sixteen years he decided to 'kick the habit'. A priest helped him, giving him a rehabilitation programme, which providentially incorporated the Twelve Steps of Alcoholics Anonymous. With the help of this Priest friend Matt modelled his life on that of the monks, who lived in Ireland in the 6th and 7th centuries. It was a tough programme of prayer, fasting and almsgiving. That was fifty years before AA was founded. After a horrendous struggle, he found sobriety through prayer and self-sacrifice. His Higher Power was the Christian God. He remained sober for forty years until his death. His life story has been an inspiration for alcoholics and addicts throughout the world. He is a candidate for canonisation in the Catholic Church. God of mercy, we bless You in the name of Your Son, Jesus Christ, who ministered to all who come to Him. Give Your strength to (name), Your servant, bound by the chains of addiction. Enfold him/her in Your love and restore him/her to the freedom of God's children. Lord, look with compassion on all those who have lost their health and freedom. Restore to them the assurance of Your unfailing mercy, and strengthen them in the work of recovery. To those who care for them, grant patient understanding and a love that perseveres. We ask this through Christ our Lord and intercession of Matt Talbot. Amen. 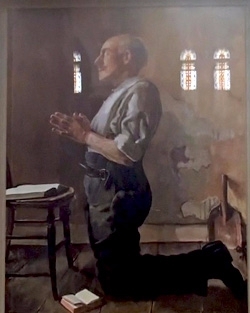 Lord, in your servant, Matt Talbot you have given us a wonderful example of triumph over addiction, of devotion to duty, and of lifelong reverence of the Holy Sacrament. May his life of prayer and penance give us courage to take up our crosses and follow in the footsteps of Our Lord and Saviour, Jesus Christ. Father, if it be your will that your beloved servant should be glorified by your Church, make known by your heavenly favours the power he enjoys in your sight. We ask this through the same Jesus Christ Our Lord.